I used to love System Center. Simply put, if you were a systems administrator / engineer / architect it did… everything. It monitors, automates, protects, virtualizes, scripts, patches, deploys, integrates… everything in your environment. It is, in a word, comprehensive. It is also big. There was a time (prior to System Center 2012) when you could pick and choose the components you wanted to buy – if you only wanted monitoring then all you bought was System Center Operations Manager (SCOM). If all you wanted was the virtualization management than all you bought was System Center Virtual Machine Manager (SCVMM). When Microsoft announced in 2012 that all of the pieces would now be sold as a single package I thought it was a good decision for Microsoft, but not necessarily a good one for the customer. Certainly it would increase their market share for components such as System Center Data Protection Manager (DPM) – which was probably from a 0.1% market share to something somewhat higher – but that was not what the customers wanted. I want a reasonably simple monitoring tool that could be deployed (and purchased) independent of everything else; I could then use the backup tool that I want, the deployment tools that I want, the anti-malware tools that I want. So when I got an e-mail from representative of SolarWinds asking if I would try out their product (Server & Application Monitor) I decided to give it a try. After all, I knew SolarWinds by reputation, and due to the non-invasive nature of the tool I could easily deploy it along side my existing SCOM environment and monitor the same servers without risk. 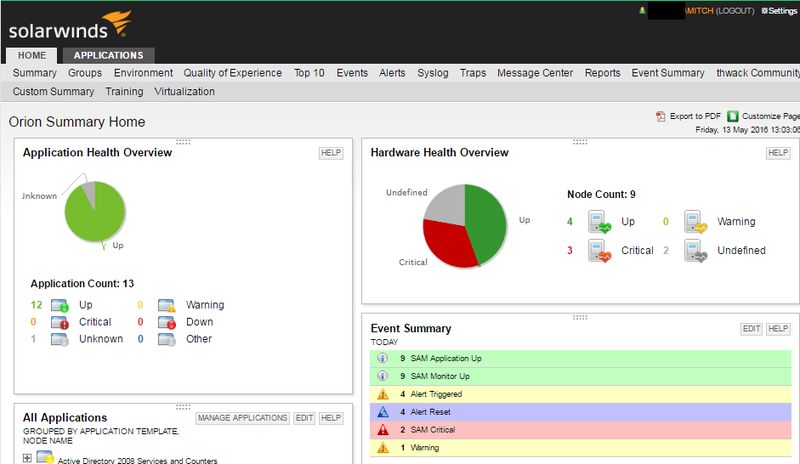 The first thing I noticed about SolarWinds was the ease with which it installed. Compared to SCOM (which even to simply install it was a bit of an ordeal (See article) it was a simple install – it did not take long, and was pretty straight-forward. While the terminology was a little different that SCOM it was easy to understand the differences, and I suspect for a junior sys admin would be pretty easy to understand. At the top of the Main Settings & Administration page the first option is Discovery Central, which allows SAM to search your entire environment for servers. The Alerts & Reports option helps you set up your mail account that sends alert & notification e-mails to the admins based on the current environment and issues. It is just as easy to send these e-mails to individuals as to groups, and configuring what is sent to whom is relatively simple. Fortunately SAM is completely Active Directory integrated, so I can just authorize my Domain Admins and other groups to access what data they need in SAM, and to grant individuals and groups granular permissions to see and/or change what they are allowed to. The dashboard is easy to read and understand, as well as customize. I want my graphs to be at the top, and I want to know anything critical up front. As with any good monitoring tool, Green=Good, Red=Bad. All of my alerts are hyper-linked so if I see something Red I can just click and go right to it. Actions, not words… If this happens then do that is a requirement in this day and age… Of course, if my monitoring tool can notify me that a service is down it is great… but how much better that it can bring it back up for me at the same time. That can be as simple or complicated as you need, but the fact that certain conditions can trigger actions and not just alerts is key for me. This was a simple task in SAM. Of course it is important to realize that some system admins will not be as comfortable learning a tool this powerful on their own, and the fact that SolarWinds offers scores of free training resources is key. The Customer Portal has more than just videos; they offer live classes and expert sessions with their engineers and experts which you can attend live or watch later. They have on-demand recordings of everything you might want to learn. Their Virtual Classroom is an amazing resource for customers who need help – whether that is learning a simple tidbit in a few minutes, or going from zero to hero over the course of a few days. My initial impression of SolarWinds SAM was that it would be a great tool for smaller businesses; that impression changed drastically reasonably quickly. Yes, I installed SAM in one of my 100 server environments in Q3 2015, and it performed brilliantly. However as I learned about it and got to know the product I was convinced it was definitely Enterprise-Class, and by the end Q1 2016 I also had it installed at a client with 19,000 users and thousands of servers. There is really only one aspect of SolarWinds that irked me, and that is the licensing model. With some monitoring tools if you have 200 servers you know you need 200 licenses. With SolarWinds a single server may require 100 licenses, depending on what you are monitoring. That is not to say that SAM will be more expensive than other tools… it is just a different way of looking at the calculations that I needed to wrap my head around. A small thing to be sure, but it is certainly an issue for me. I was offered a trial period with SAM to try it out in my environment, and when that trial period ended I decided to renew. SolarWinds has a great tool here, but more important to me is the support that I have been able to get from the company, which has extended beyond simple ‘how do I…’ questions. Their engineers have gotten on-line with me to help solve a couple of custom issues that arose, and they were happy to do it. The product offering is a home run for system admins who want a monitoring and reporting tool and do not want to break the bank… or change out all of their other management tools to drink Microsoft’s Kool-Aid. Small environment or large, SolarWinds is worth it. Contact them at www.solarwinds.com for more information, and a demo of their offerings! ← Rules: Why are they Client-Side only? Great write up, thanks for taking the time to do a review. Let me know when you want to talk database performance, I’d love to see your take on another tool of ours called Database Performance Analyzer.